North Yorkshire's fire and rescue authority has voted to increase crews to four firefighters on some fire engines, reversing a 2015 decision. The move follows a row over the introduction of smaller Tactical Response Vehicles (TRVs) carrying a crew of three. 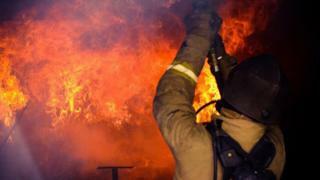 The Fire Brigades Union (FBU) said having just three firefighters was a "threat to public safety". It welcomed the "ground-breaking decision" to boost crew numbers. The brigade introduced six TRVs in 2016 to replace six standard fire engines crewed by four or five firefighters. The decision was made to save about £1.5m a year and led to industrial action by FBU members. Councillor Andrew Backhouse, chairman of the county's fire authority, said: "Serious concerns were raised with me about the crewing of the TRVs with three members of staff." Four firefighters are now to crew the TRVs at Malton, Tadcaster, Northallerton and Ripon, said the authority. "There are no current plans" to change crewing at Scarborough and Harrogate, as the stations had a second appliance crewed by "wholetime firefighters", it added. Steve Howley, brigade secretary of North Yorkshire FBU, said: "I am very pleased the new chair of the fire authority listened, considered and acted upon our concerns." At the meeting on Wednesday, the FBU was also given a seat on the authority.